AYURVEDIC HEALING is a complete manual of Ayurvedic health care. It offers the wisdom of this ancient system of mind-body medicine to the modern reader relative to our special health concerns today. It provides an Ayurvedic treatment for all the main common diseases of the systems of the body from the digestive system to the nervous system and mind, giving special dietary and herbal recommendations, including specific herbal formulas. The 2001 edition is an expanded version of the original 1989 edition, covering additional diseases and adding new treatments. The book remains one of the most commonly used Ayurvedic treatment manuals in the West, used widely by Ayurvedic and herbal practitioners. 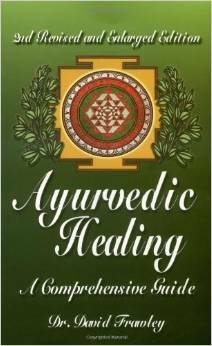 This is a required reference book and foundation material for our Ayurvedic Healing course.